"Whereas any European power has to support a vast army first of all, we in this fortunate, happy island, relieved by our insular position of a double burden, may turn our undivided efforts and attention to the fleet. Why should we sacrifice a game in which we are sure to win to play a game in which we are bound to lose?" Britain's twentieth century was defined, for the first time in over five hundred years, by a monumental shift in national strategy. The maritime approach, upon which the country had built its wealth and power, was founded on the principle of limited coercive action delivered by mobile naval forces. In the twentieth century this was abandoned in favour of a less than limited continental military strategy that, with hindsight, proved to be disastrous. The forces created to fight two World Wars, deal with the increasing burdens from imperial defence and later the Cold War, managed decolonisation and the 'Global War on Terror' have severely limited the country's ability to project power in defence of its interests. It's difficult to pinpoint exactly where the change began, but it was likely after the Second Boer War. Britain has just emerged from a bloody three year long conflict against the Dutch Boer settlers of the Orange Free State and South African Republic. For the first time in many years Britain faced a colonial opponent that they did not technologically over match. While their near-absolute naval dominance meant that no great power dared to seriously intervene in the conflict, although a number flirted with the idea, it could not provide a solution to the challenge posed by the Boers. Instead an enormous, by British standards, Imperial land army of 500,000 troops was raised and used to effectively bludgeon the ~80,000 Boer fighters into submission. The cost was enormous: £210 million at the time, which equates to over £200 billion in today's money. More important than the financial cost though were the lessons drawn from the war by the British establishment, and applied in the Haldane reforms of 1906-1912. The changes to the British army that were effected could not have come at a worse time. They stipulated the need for a large six division strong regular intervention force, to be deployed to the continent in the event of a major war. This would be backed up by the even larger fourteen division strong Territorial force, who would provide follow on forces and replace losses amongst the regular formations. While the reforms also included welcome changes, such as the professionalisation of the Officer Corps and the development of an Imperial General Staff, they effectively committed Britain to the deployment of a large land army in the event of a major European war. Just two years later Britain was plunged into just such a war. The structure worked exactly as planned in 1914, the 100,000 strong British Expeditionary Force (BEF) mobilised swiftly and deployed to the continent without loss, protected by a Royal Navy that was still overwhelmingly superior to its opposition. Once ashore, however, events did not unfold as some had expected. The intense fire of a modern industrial war burned through the original BEF, the "old contemptibles", in the opening campaign of 1914. 1915 swallowed the fourteen Territorial divisions, and the regular BEF built by Haldane had effectively ceased to exist by the end of the Second Battle of Ypres. What made the First World War different though wasn't that Britain's small army was chewed up by its larger continental foes, but what came next. The Secretary of State for War, Lord Kitchiner, in 1914 implemented a plan to build an enormous volunteer "New Army" of sixty divisions: some two million men strong. When the volunteers dried up the government turned, for the first time, to mass conscription to fill the ranks of the army. The First World War was the moment when the UK went from flirting with the idea of continental land power, as a solution to certain tactical problems, to actually basing it's national strategy around it. Nobody will know if the First World War could have been won with a radically different British strategy, using it's peerless strength at sea to greater effect. The French Revolutionary and Napoleonic wars seem to suggest that an expansionist militaristic European power, trapped in Europe and blockaded by a naval power, would sooner or later overreach and collapse in the face of its enemies. 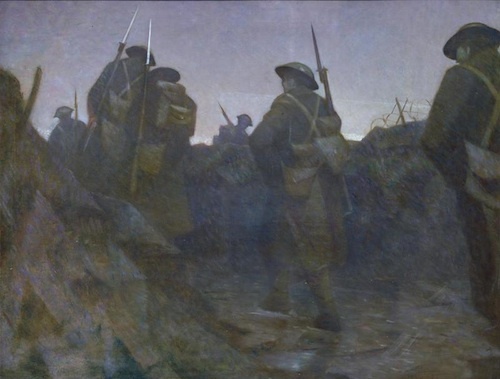 Such a war would not have been quick or easy, but might have avoided much of the sacrifice of the Western Front, and the many hundreds of thousands of British and Empire lives lost there. It is also debatable that had Britain's political leaders been clearer in their diplomacy, and more willing to actively deter Imperial Germany with the Royal Navy, the war may have been avoided altogether. It is needless to say that the war proved a profound shock to a country whose last real experience of continental power ended with the conclusion of the Hundred Years War in 1453, and the steady loss thereafter of the last major pieces of the continental empire built by the Plantagenet dynasty. The sheer trauma of the First World War embedded itself into Britain's society, comprehensively destroying the pervasive national confidence of the nineteenth century. The Britain of 1919 was a shadow of its former self, while still an impressive Imperial titan, the system was becoming increasingly hollow at the centre. The UK had borrowed enormous sums of money during the war to loan to it's allies: France and Russia. When Tzar Nicholas II, and later the pro-western provisional government of Alexander Kerensky, were overthrown in 1917 by Bolshevik Communists any hope that Britain would see its money back from the loans it had given the Russian government evaporated. Britain's war debts were enormous, standing at ~175% of GDP in 1920. However, it was the interest on that debt that did the real damage. 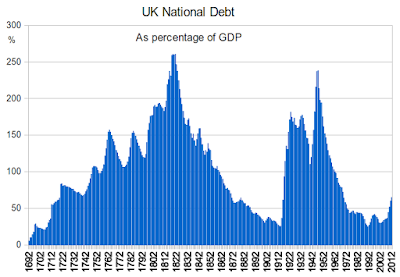 In 1914 the interest on the UK's national debt stood at just over 2% of GDP; by 1920 it was 6%, between 1924 and 1934 it hovered around 9% before steadily declining until 1939. 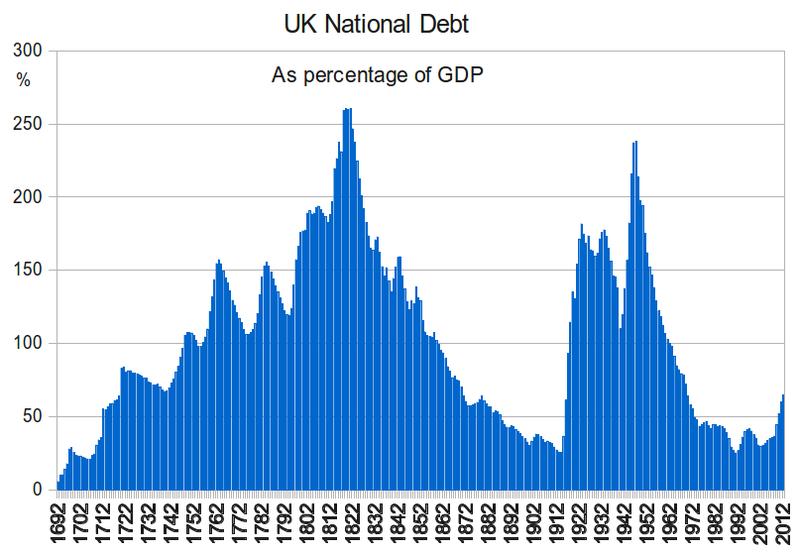 For a full decade a tenth of the UK's GDP was being used up just servicing it's debts from the First World War. Understandably, such ruinous levels of debt imposed severe burdens on the British government, leading them to pursue arms reduction as a means of controlling national expenditure. The Washington Naval Treaties of 1922 and 1936 surely stand as a testament to the decline in Britain's power, forced on them by the long term costs of the First World War. The "two power standard", which stipulated that the Royal Navy be equal in strength to the fleets of the next two great powers combined, was relinquished for simple parity with the second naval power: the United States. Britain likely avoided a costly naval race, and worsening relations with the Americans, but sacrificed a century of supremacy at sea with the stroke of a pen. What's worse, the dearth in naval shipbuilding caused a significant contraction in Britain's naval construction capacity. While civilian yards could still be contracted to mass produce simple designs in wartime, bottlenecks in the fabrication of armour plate, large naval guns and complex equipment severely limited Britain's ability to re-equip the navy in the late inter-war years. British planners tried to grapple with the problems of imperial defence between the world wars, protecting an Empire knitted together by maritime communications. Underinvestment and the Washington treaties ensured that the navy would go to war on 1939 with an assortment of inadequate equipment, much of which dated back to the First World War. In the meantime the Axis powers systematically ignored and avoided the limits imposed upon them. The failure to modernise the Royal Navy had the clearest consequences for British possessions in the Far East. A vast new naval base was built at Singapore between the wars, but with no fleet to make use of it. It was planned that units would be moved from the Atlantic in the event of a war (with Japan), but when that war came in 1941 the navy was already totally tied down in the West fighting Germany's U-Boats and surface raiders and the Italian navy in the Mediterranean. 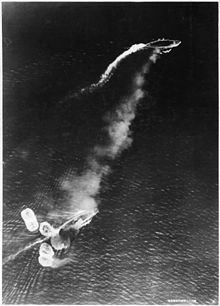 The token force sent to Singapore, in a futile last minute attempt to deter the Japanese, was sunk in short order by aircraft off the coast of Malaya soon after the outbreak of hostilities. Without an overwhelmingly powerful naval deterrent Britain's overseas possessions were easy targets for its rivals. under attack by Japanese aircraft, 10th December 1941. While the maritime component, upon which Britain's power rested, was allowed to deteriorate plans for the next war with Germany were developed. Shockingly, the strategy for the second war was an almost direct re-run of the first. A protracted period of static fighting in France and Belgium, by Anglo-French armies, while the allies mobilised the resources to carry the war into Germany. The disastrous French campaign of 1940, and the evacuation at Dunkirk, put paid to British participation on the "central front" against the Wehrmacht in Europe until 1944. The Second World War thus, in reality, played out far less like the first and far more like the long struggle against Napoleon over a century earlier. The Royal Navy systematically seized control of the North Sea and Mediterranean, slowly defeating the Kriegsmarine's commerce raiding strategy, and denying the European Axis powers the ability to reach outside of the continent. Mussolini's ill considered North African adventure played out like Napoleon's. With Britain in control of the sea, Axis forces cut off from their logistics networks and their armies starved of supplies it was only a matter of time before they were forced to surrender. As with Napoleon in 1812, in 1941 Hitler had nowhere else to go Except East into Russia. There his armies were systematically bled by bitter resistance and a hostile climate, before being smashed to pieces in a series of vast counter-offensives, that took Soviet armies to the gates of Berlin. Just as Russian armies had marched into Paris over a century earlier. Britain's contribution was not at all inconsequential, at a modest cost in lives the German state was denied use of the sea, the Soviets were bolstered in their fight against the Wehrmacht and the Luftwaffe was mauled over Britain, then defeated over Germany. Ironically the abject failure of Britain's continental strategy in 1940 allowed for a shift back to a more successful maritime strategy. Despite chronic under-investment before the war the Royal Navy proved it's fearsome reputation was not undeserved, and fought with all the skill and determination of its Napoleonic ancestor. As for the British army: from North Africa to Italy and France it was situated wherever the 'soft underbelly' of the Wehrmacht happened to be, fighting alongside continental allies it forced the Axis to divert vital resources away from the decisive theatre: the Eastern Front. If the First World War was a Pyrrhic victory for Britain, the second was a catastrophe. While the country could be counted amongst the victors it was certainly not a winner. A third of its economic assets had been sacrificed in the first war, and half of what remained in the second. The continental approach failed to bring victory in 1940, the Fall of France forced Britain to undertake an enormously expensive crash rearmament programme which required the large-scale conversion of civilian industry. This, along with other factors, would contribute to the steady decline of Britain as a competitive industrial power in the post-war world. By 1945 the country was enormously overstretched and financially exhausted. All the advantages that Britain had used to build her position in the world: maritime supremacy, strategic mobility and the precise application of force to achieve limited aims, had been sacrificed in pursuit of the continental armed forces presumed necessary to defend the homeland and the Empire. If the Second World War was, in significant part, fought to preserve Britain's position at the centre of an Imperial system, then the continental military strategy proved a spectacular failure. In the post-war world the commitment to continental power continued unabated, despite its abject failure to advance British interests in two world wars. Britain retained its vast wartime conscript army long after the conclusion of the Second World War, in order to deal with new pressures from the European theatre of the emerging Cold War and decolonisation. By 1945 large land forces had become a permanent fixture in British defence planning, which imposed serious demands on an increasingly squeezed defence budget. Policing and relinquishing the vast land empire Britain had accrued over the course of the nineteenth century has also begun to take it's toll. Managed decolonisation proved to be a far more costly and manpower intensive business than the original conquests that had created the empire. At the height of the Malayan Emergency 40,000 commonwealth troops, the vast majority of whom were British, were tied down fighting the Communist insurgency there. A further 24,000 British soldiers and police tried unsuccessfully to suppress the Jewish insurgency in Palestine, until their withdrawal in 1947. Ten thousand regulars were required to combat the Mao Mao rebellion in Kenya, and thirty thousand were deployed to the colony of Aden at the peak of the conflict there. The list goes on but policing the empire, even when the process of decolonisation was well under way, became a major drain on Britain's military resources. and move the country towards decolonisation and democratic rule. Aside from colonial policing, the other continental commitment that stretched Britain's resources in the post-war world was the occupation of Germany and later the commitment to NATO. The British Army of the Rhine, and it's reinforcing forces, had nearly half the 316,000 soldiers in the army of 1960 assigned to it; with around 50,000 continuously forward deployed to Germany. Britain's commitment to the defence of Germany would steadily become an unhealthy fixation, a single narrow role was being conceived for the armed forces. As further economic pressures exerted themselves, the unchanging NATO commitment became a millstone around the country's neck. The needs of the Western alliance were always placed above the creation of mobile and flexible forces well suited to the defence of Britain's national interests outside of Europe. The weaknesses in Britain's maritime forces were already plain to see in the aftermath of the 1956 Suez war. Inadequacies in carrier air power, airbases ashore and sealift available at short notice would ensure that, by the time the preparatory bombing had been completed, the Anglo-French intervention force had lost the political initiative. The belated ground invasion that followed was cut short well before it achieved its objective: presenting the world with the fait accompli of an Anglo-French controlled canal zone. In the years that followed a declining defence budget, inter-service politics and the demands of a Eurocentric continental strategy would ensure that most of these deficiencies would never be properly addressed. The withdrawal from East of Suez just over a decade later was as much about the prioritisation of the European theatre of operations as it was about the stated aim of cutting the cost of overseas bases. Proposals by the Royal Navy in the late 1950s suggested that the commitment could have been met by naval forces operating from a single large base (likely in Australia). Although this was ruled out on cost grounds, the navy's proposed "double stance" single-base concept would have required six large aircraft carriers, the more modest three carrier "single stance" Joint Services Seaborne Force (JSSF) proposal, operating from bases in Singapore and Bahrain, was both achievable and affordable. The JSSF concept envisaged a mobile and flexible medium-sized maritime intervention force to deliver the East of Suez commitment. 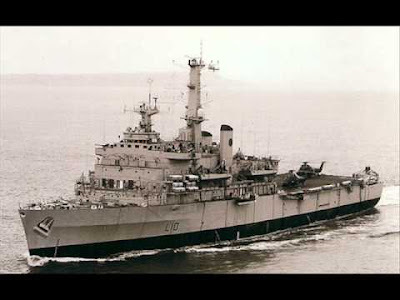 Although parts of the idea, like the modernisation of Britain's amphibious shipping, were realised the overarching concept was steadily killed off by attacks by the other services in the second half of the 1960s. Notably the RAF's victory in the 1965-66 battle over the replacement of the conventional carriers, and the temporary success of their alternative "island strategy" before Britain's East of Suez role was officially abandoned altogether in 1968. 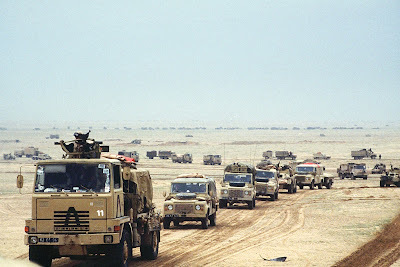 Operation Vantage, the UK response to the 1961 Kuwait crisis, proved just how effective flexible seaborne rapid reaction forces could be at nipping crises in the bud, before they could develop. It was a classic maritime response to a threat to British regional interests: a short, sharp, demonstration of force designed to achieve a limited objective, followed by withdrawal and the poising of forces offshore to cement the success of the initial action. However, the decision to withdraw from East of Suez bases, notably in Aden, Bahrain and Singapore, was as much about post-imperial retrenchment (and the idea that Britain's "new place in the world" was as a European power) as it was about the cost of maintaining those expensive facilities in the wake of the 1968 sterling crisis. Once again the choice to focus on a continental structure and role for the armed forces failed to support the UK's position as a global power, capable of projecting force in support of its interests. Instead of smaller but highly mobile maritime forces projected from a single large base East of Suez, the UK ended up with expensive and relatively immobile forces tied to a number of bases scattered across the region. In short: an increasingly unsustainable drain on resources with no European cold war role. Said maritime force could have been withdrawn to Europe in the event of a crisis, whereas comparatively immobile troops and land-based aircraft would have been considerably more difficult to redeploy at short notice. With the end of National Service (conscription) in 1960 the stream of cheap manpower used to support Britain's array of overseas bases steadily began to dry up. 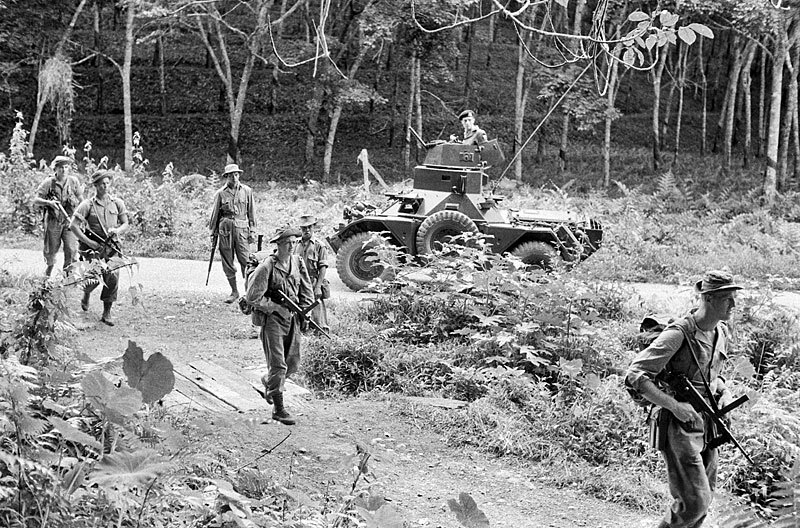 As the process of decolonisation continued apace the army would shrink by half in less than twenty years, as the cost of manpower and equipment steadily rose throughout the 1960s and 70s. Even while spending a substantial proportion of it's national income on defence (between 1960 and 1980 it hovered around 5-6% of GDP) the country could not afford both a robust continental army and a globally deployable power projection navy. 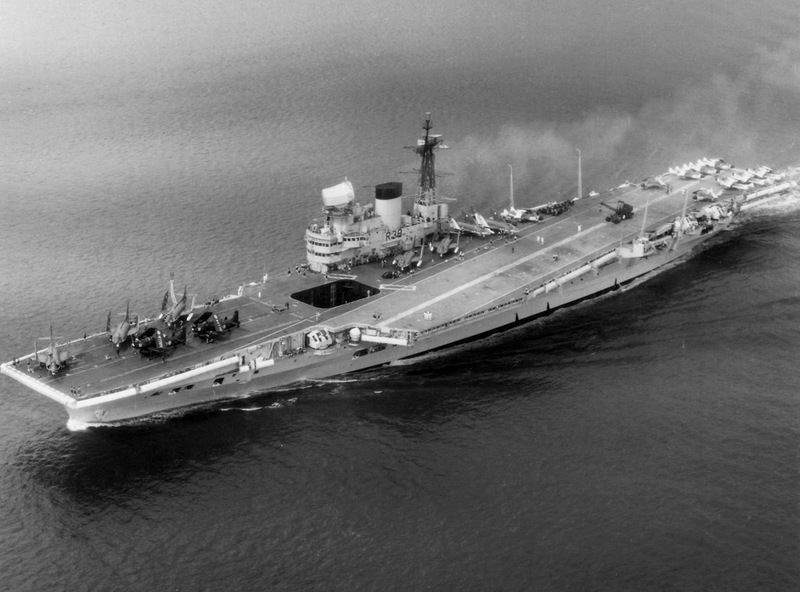 Throughout this period the government essentially "fudged" the issue by maintaining existing maritime forces left over from the rearmament programmes for the Second World War and Korea, but not replacing essential equipment like the conventional aircraft carriers (cut in 1966) when they reached the end of their lives. The government, and the new ministry of defence, initially attempted to cut a "middle way" between the continental and maritime spheres, that appeased the interests of all three services, which spectacularly unraveled in the late 1960s; as Britain abandoned its presence East of Suez, and left the defence of its interests there to the United States. The incoherence of this policy was soon laid bare, after less than a decade away from the region the Royal Navy returned to the Arabian Gulf, to protect Britain's interests there and safeguard civilian shipping. In the long term the main consequences of "withdrawal" were the significant weakening Britain's regional influence, a major loss of military credibility and the abandonment of a handful of mostly useless bases (and two extremely useful ones in Bahrain and Singapore). Commitments to Southeast Asian stability (expressed after 1971 in the UK's membership of the Five Powers Defence Arrangements) could not be easily abandoned, nor could the UK extract itself from the commitments that derived from its dependence on Gulf oil. Slightly more than a decade after the last British troops were withdrawn from East of Suez, in which time defence policy had become focused on the continental confrontation with the Soviet Union in the European theater and the worsening situation in Northern Ireland, the unexpected happened. During the 1982 Falklands crisis, and the war that ensued, the fundamental assumptions upon which UK defence planning had rested for a decade came apart at the seams. The infamous 1981 defence white paper, overseen by then defence secretary John Nott, envisioned a severely limited role for the UK's maritime expeditionary forces. While the Royal Marines were to be retained, the two Fearless class amphibious ships were to be retired without replacement in 1982 and 1984. One of the three Invincible class light anti-submarine carriers would also be sold, as would the much older Centaur class carrier HMS Hermes. The review clearly prioritised Britain's continental commitment to NATO, with the Army and RAF both accepting a cut in manpower in exchange for new Challenger tanks, the retention of the F-4 Phantom, the introduction of the Tornado ADV fighter and the purchase of a fleet of new AV8B Harrier IIs. Fortunately for the United Kingdom, the Falklands crisis broke before the white paper's programme of changes could be fully implemented. The resulting conflict saw a British tri-service task force, similar in concept (if not in scale) to the JSSF envisaged in the early 1960s, sail half way around the world and recapture the islands from heavily entrenched Argentine forces. In 1982 maritime forces proved flexible, responsive and mobile enough to "go to the crisis" with sufficient force to decisively impact events on the ground. It is also necessary to point out that the Falklands crisis, and the subsequent war, did not appear as a bolt from the blue. Argentina's intentions, and the need for a robust maritime force to deter attacks on Britain's scattered overseas territories, had been relatively obvious since their 1976 occupation of Southern Thule. It has been suggested by some that Operation Journeyman, the dispatch of a small naval task force the next year; in response to the occupation, may have deterred an earlier Argentine move to invade the Falklands proper. The position of the ministry of defence, their myopic focus on the European theatre and the Cold War, ensured the maritime power projection would be severely neglected. This happened to such an extent that it almost caused a military defeat, that would have had catastrophic effects on Britain's international standing. Even with the few legacy pieces of equipment like the amphibious ships and HMS Hermes the operation to retake the islands was, in the words of the ground force commander Major General Jeremy Moore, "a damn close run thing". It is a sobering thought that if the war had happened just two years later none of the legacy equipment, that proved critical to Britain's success, would have been available. The likelihood is that the operation probably wouldn't have even been attempted. disposal in 1982 and 1984 respectively. While it is fair to say that the war in the South Atlantic saved elements of the UK's maritime force projection capability, it didn't initiate a significant change in national strategy. The overriding focus remained on the European continent, NATO and the Cold War. Unfortunately for defence planners all of this came crashing down, along with the Berlin Wall, in 1989. The collapse of the Soviet Union did not bring about "the end of history" as some optimistic commentators suggested at the time. Instead it ushered in a decade of instability in the former Communist bloc and further afield. The 1990s were not the "easy" decade for the West that they are now painted as. While the Cold War had furnished Europe and the United States with large and capable armed forces, they were often used to manage threats they had not been designed for. The decade was defined by ongoing and brutal conflicts in the Gulf and Balkans, both tied to the collapse of the Cold War world order. While the 1990-91 Gulf War would appear, on its face, to be a successful continental-style war that the British played a significant part in, in fact it was anything but. It is not difficult to see that the UK contribution of just under 54,000 soldiers, sailors and airmen pales in comparison to the ~700,000 deployed by the United States. The war was overwhelmingly an American show, with coalition forces mainly there to add legitimacy to UN-backed US action. In light of this Britain's contribution can be seen as militarily useful, but by no means essential, and, more than anything else, politically advantageous for the United States. Worse for the United Kingdom though were the glaring deficiencies in the Cold War continental army that the war exposed. In order to achieve "maximum deterrent value" the BAOR's combat service, support and logistics elements had been neglected in order to generate larger combat arms. What this meant in practice was that much of the British army's heavy combat equipment in Germany was unserviceable and very difficult to deploy. Government investigations into the conduct of the Gulf war revealed that BAOR's Challenger I availability in 1990 was only 23%, with the rest being under repair or out of service. While the British Army could rely on an established logistics system in the NATO area, to support its forward-deployed forces in Germany, no such system existed for long-range expeditionary operations. British forces famously had to ransack almost their entire BAOR stockpile in order to scrounge together the equipment and ammunition to put a single Division in the field in 1990. Even then, without the backing of the US logistics network it is doubtful that they could have been sustained in high intensity combat for very long. In the years after the Falklands war the army examined and dismissed the Brigade level logistics structure, used by the Royal Marines to great success in 1982. Their contention was that it would impose the burden of providing additional supporting forces upon the BAOR. As the Gulf War showed, even if a direct copy of the Marines' approach was inappropriate, the Army's logistics were inadequate for the large expeditionary operations they found themselves conducting. By the end of the Cold War Britain had the worst of both worlds, a hollow and immobile continental army and a severely neglected power projection navy. The 1990 "options for change" review, instead of charting a new path for Britain's armed forces that would better suit the new geo-strategic environment, simply cut evenly across all three services to produce a "peace dividend". The army and RAF were not withdrawn from Germany, their mission complete, but instead lingered there as the reduced "British Forces Germany". The 1994 "front line first" review brought more mixed results. The ongoing conflict in the Balkans highlighted the need for robust intervention forces, and the amphibious sealift to move them. This helped persuade the government at the time to place orders for a dedicated helicopter carrier (which would eventually become HMS Ocean) and two new ships to replace the ageing Fearless class amphibious landing ships. However, at the same time deep cuts fell on the network of logistics and support structures. 17 depots were closed, and all three services suffered further manpower reductions. Britain's contribution to peacekeeping and peacemaking in the former Yugoslavia throughout the 1990s stands as a good example of how small but mobile forces, capable of achieving limited goals, can effectively secure broad national interests. 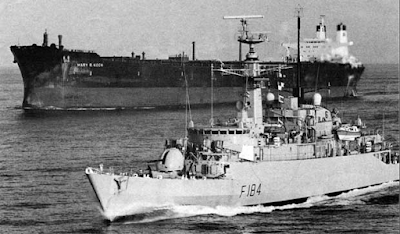 The Royal Navy spent the five years from 1991-1996 playing a leading role in first monitoring and later maritime interception operations in the Adriatic, enforcing the UN arms embargo on the conflict area. Despite there being around 400,000 people under arms in Bosnia alone between 1992 and 1995 the British contingent of the UN Protection Force (UNPROFOR), numbering only 8,000 troops at it's height in August 1995, was able to achieve significant results using limited coercive force and acting in close concert with diplomatic efforts. By attaining a succession of limited aims the international peacekeeping force was able to improve the situation on the ground with local peace deals, which steadily built momentum for an internationally enforced general ceasefire. 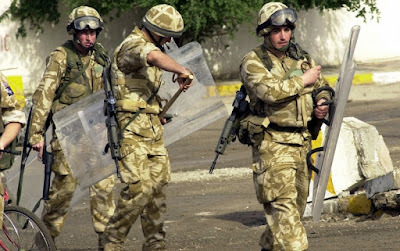 At its absolute height, as part of the 80,000 strong international Implementation Force (IFOR) deployed in 1995 to enforce the peace, the UK contingent increased to just under 12,000 troops until IFOR was disbanded and replaced with the smaller Stabilisation Force (SFOR) at the end of 1996. Britain's contribution to the latter was just over 5,000 troops. While the war in Bosnia bore little similarity to Britain's past maritime operations on the TV screens of the public, in reality it carried all the hallmarks of an effective maritime intervention. The use of limited coercive force to achieve limited aims, the use of a naval blockade to starve the warring parties of military equipment, the use of military force as part of a carefully considered political strategy and larger-scale action conducted alongside continental allies. Many of the lessons of fighting in Bosnia, and expeditionary warfare in general, formed the basis of significant structural changes to the armed forces laid out in the 1998 Strategic Defence Review. The creation of "Joint Rapid Reaction Forces". It specified the need for increased deployability and a focus on expeditionary duties for the army, with the planned addition of the logistic elements necessary to support two medium sized deployments simultaneously. The foundations were also laid for the eventual replacement of the Invincible class carriers with two new larger ships, what later became the CVF programme, and has now resulted in the two 70,000 ton ships of the Queen Elizabeth class. The SDR also laid the groundwork for the excellent Bay class auxiliary amphibious ships. The trade-off for the Royal Navy were small decreases in the number of escorts, submarines and a reduction in the planned fleet of minehunters; from 35, 12 and 25 to 32, 10 and 22 respectively. The number of Merlin anti-submarine helicopters was also curtailed at 44, with upgraded Lynx helicopters making up some of the shortfall. Amidst all the technical detail of the 1998 review one thing was clear, it was the first sign of an major realignment of British defence strategy. Although a substantial portion of the army still resided in Germany the SDR laid out a shift towards forces tailored for mobility and limited maritime intervention. The army's airborne forces were merged to create a new formation, 16 Air Assault Brigade, that would be held at high readiness along with the Royal Marines of 3 Commando Brigade. The interventions in Kosovo and Sierra Leone in 1999 and 2000 proved that the new structure did indeed offer greater mobility and flexibility for intervention operations conducted at short notice. Maritime force projection, limited aims and operating alongside allies where necessary once again proved to be a winning combination for the UK. While it is easy to write at length on the less than stellar outcomes of the "Global War on Terror", launched by President George W. Bush in the wake of Al Qaeda's attacks on New York and Washington, I shall focus instead on the effects that the wars in Afghanistan and Iraq had on the British armed forces. While the initial interventions in both countries swiftly achieved their aims, the removal of the Taliban and Saddam Hussein from power, the British armed forces were steadily drawn into a pair of open ended "enduring stabilisation operations"/counter-insurgency wars with expansive aims; for which they were poorly prepared and inadequately equipped. Without an increase in the defence budget to fund these wars assets, programmes and capabilities not directly linked to supporting ongoing operations were neglected, cut or reduced. The Royal Navy suffered particularly harsh reductions, with the number of escorts reduced from thirty-two hulls in 2001 to nineteen in 2014 and the number of nuclear attack submarines falling from twelve to six. Important amphibious and utility shipping was also lost in 2010 with the sale of RFA Largs Bay to Australia and the mothballing of one of the Albion class LPDs. There was also the much publicised retirement of the carrier Ark Royal and the Harrier jump jet, effectively "gapping" UK carrier strike capability for a decade. For those that would argue the reductions were a result of the 2007/8 financial crisis, rather than a result of fighting two extremely expensive wars, seven of the thirteen escorts lost from 2001-2014 were retired without replacement before 2007, as were three of the five nuclear attack submarines. The retirement of Ark Royal in 2010 was a logical step, as the Harrier aircraft that made up her air group were heavily committed to the war Afghanistan and had been unavailable for serious carrier deployment for several years. Sadly, for all the progress towards the more limited, mobile and maritime defence structure outlined in the 1998 review much of Britain's naval capacity was beggared on the altar of attempting to sustain an unsustainable tempo of operations. The army's withdrawal from Iraq in 2008, and subsequent "doubling down" on the Afghan mission, came because they were completely unprepared to conduct two large stabilisation operations simultaneously. Even solely focusing on Afghanistan the army weren't able to deploy enough troops to Helmand province to achieve the objectives they were set. It would eventually require the introduction of thousands of US Marines alongside the British contingent to begin to wrest areas away from the Taliban insurgents. While a culture of optimism, the famous "can-do" attitude of the British armed forces, prevailed at the top; a more sober analysis of the situation showed that these operations were unsustainable, unlikely to achieve the lofty aims set with the resources available and were doing serious damage to the UK's ability to conduct limited power projection operations. Almost without exception the overriding lesson of the last hundred years, from the outbreak of the First World War in 1914 to the withdrawal from Afghanistan in 2014, is that Britain's adoption of a continental strategy failed to support the country's position in the world. Two bloody and ruinously expensive World Wars were followed by decades of colonial policing, retreat from parts of the world vital to UK national interests, an increasingly burdensome Cold War commitment to the defence of West Germany and finally two expensive and damaging counterinsurgency wars in Iraq and Afghanistan. We need to learn the lessons of our history, and of the last century, to see that this is; as Churchill put it "a game in which we are bound to lose". It is not difficult to recognise that the UK has the potential to generate extremely effective armed forces tailored to conduct limited maritime expeditionary warfare. It is plain to see that generating continental forces that are expensive enough to undermine the UK's power projection capabilities, but not large enough to effectively fight continental wars or defend Britain's national interests, is a foolish waste of resources. The campaigns in Iraq and Afghanistan have been bruising experiences for the United Kingdom, seriously denting the prestige of the army and the confidence politicians have in the military's ability to provide solutions to complex problems. It would appear that now is the perfect time to once again espouse the benefits of a more limited and cautious maritime strategy for Britain. Thankfully the core strength of the Royal navy, while depleted, is far from broken. With new power projection equipment, not least the Queen Elizaebth class aircraft carriers, due to enter service soon; those at the top may begin to see what they've been missing for the last three and a half decades. Those that advocate the strength of maritime strategy for the UK shouldn't get too carried away, the argument is far from won and there will be those that vehemently disagree. Although the 2015 Strategic Defence and Security Review appears to shift the focus back to a more maritime, limited and expeditionary focus it remains to be seen if it really has heralded a real shift in Britain's national strategy or if, like the 1998 review, it will promise much change but in practice deliver more continental military entanglements. Until we know for sure where this new direction will take us we should always look to our recent history, and ask the question: "Why should we sacrifice a game in which we are sure to win to play a game in which we are bound to lose?" I agree that UK should pursue a Maritime Stategy rather than the Continental Stategy we have chased for far too long. The Central Front of NATO has expanded far to the East and it is not a situation that suits UK strategic position. Its too far East for us to deploy effectively. NATO has a shortfall in its Maritime power projection as well as its shifting Eastern Border. It makes sense for UK to concentrate on its strategic advantage. UK can contol and dominate the UK-Iceland-Greenland Gap, the North Sea, the North Atlantic, support in and reinforcement in the Norwegian Sea, and project into the Mediterranean Sea. No other Nation is positioned to do this so effectively. But it cannot be done by such a tiny Maritime capacity. UK should concentrate on being the dominant regional Naval Power. This is increasingly important, as the USA concentrates its strategic focus on the Pacific; the more that UK takes responsibility for the Atlantic, the more that USA can divert its power to its key strategic issues. As the UK Army is being steadily reduced in numbers, it would seem sensible for us to concentrate on rapid deployment and reinforcement of the flanks of NATO. I suggest that with concentration on Maritime power, backed up with a substantial and signicicant increase of Air Transport capacity (including far more in strategic lift as well as substantial increase in helicopter assets,) the UK can act as elite reinforcement of a threatened area; (a sort of National ACE Mobile Force) a force multiplier to existing allied assets. The main Central Front of NATO must be defended by the main Continental Powers, i.e. Germany, Poland, Hungary, and to a lesser extent France. Germany has had serious advantages during the Cold War of relying on UK and USA mainly to provide for its defence whilst building up its economic prowess. It is time Germany absorbed its full responsibility and the cost, as the main Central European Power, and substantially increased its Continental Land Forces. By concentating on a strong Maritime Strategy, UK will fulfill its strategic position in NATO as a maritime nation, whilst also having to forces to intervene in international (outside NATO area) commitments. A case in point is the remarkably successful intervention in Sierra Leone that was achieved with power projection from the sea. UK must maintain sufficient Maritime and Air Transport assets to project what meagre army assets are left abroad when required. Its all well and good having armed forces, but pointless if you don't have the means to put them where they are needed most. This requires a strong Royal Navy, strong Amphibous forcess, strong RN Reserve and a sufficient and signicicant Strategic Air Lift capacity. Sorry I haven't had the chance to read your full blog yet, but as one of the better commentators on UK Defence Forum and I see a War Studies student I have a question. To be more precise how would you, or your War Studies department define War? I ask because to date I've not found what I would regard as an acceptable definition and certainly not an agreed one. I like Clausewitz's definition from On War: "an act of violence intended to compel our opponent to fulfil our will"
A difficult read, but he did have many very useful insights. Does war require violence? Most people would of course say yes, I would contend that it doesn't. Czechoslovakia in 1938 is an interesting example. The use of force in pursuit of a political aim.